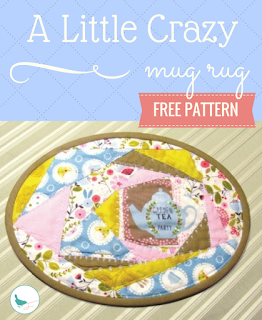 "This charming mug rug is a foundation pieced design inspired by the crazy quilt. It measures 10 x 7-1/2 inches. I love the oval shape and the fussy cut center adds an interesting focal point. The piece is quilted with decorative machine stitching to mimic crazy quilt embroidery. This would be a fun and fast project for anyone new to foundation paper piecing. Pattern includes instructions for how to do a fussy cut (with template) and how to cut foundation fabric accurately. You can also see my photo tutorial on cutting your fabric."